Driver Ed in a Box® curriculum is approved and regulated by the Colorado Motor Vehicle Division. Certificate for Approved Driver Education Curriculum on file from the CO Department of Revenue. 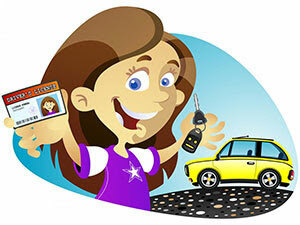 Your teenager can begin our driver education training at the age of 15. Then, if they have completed our driver education classroom requirements, they can get their Learner’s Permit as early as the age of 15. They must hold their Learner’s Permit for twelve months prior to applying for their Driver License. After you complete the entire classroom phase of Driver Ed in a Box®, we will return to you the DR2460 Form that is required to obtain your Learner’s Permit. After obtaining your Learner’s Permit (remember you must be 15 years of age to get your permit), you must complete a minimum 50 hours of behind-the-wheel driving with ten of those driving hours being done at night using our DVDs (15 behind-the-wheel training videos included), Parent Companion skills and log sheets, 3 audio CDs giving you tips and guides for each driving segment, the training mirrors and Student Driver signs. At the completion of the driving instruction you will send us the Affidavit of Instruction from the back of your Parent Companion. If you have any questions regarding how to use Driver Ed in a Box® in Colorado, please contact us at 1-800-562-6405. The Driver Ed in a Box® program gives you the tools to master the skills of each section of driving (we break it down to Parking Lot, Neighborhood, Two Lane and Four Lane Light Traffic, Freeway, Rural and Heavy Traffic). With our checklist and audio CDs, it allows the student to master the skills required in each area at their own pace before moving on to the next section. All of this is completed during the state required permit time and satisfies the 50 hours of behind-the-wheel instruction Colorado requires. Driver Ed in a Box® will assist you with your teenager’s driver education needs and at the same time teach them to become a safe, collision-free driver. Parents using Driver Ed in a Box® to work directly with their teen and supervise their progress ensures the safest teen drivers on the road. *Teens may be eligible to obtain their driver license prior to age 16 years and 6 months if they also complete 6 hours of behind-the-wheel training from an approved school (for details of exceptions to this rule, see page 5 of the Colorado handbook in our materials).